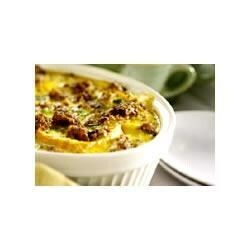 "Sausage, jalapeno and cheese are layered with bread in this spicy Tex-Mex breakfast casserole." Preheat oven to 350 F. Begin by mixing the eggs and heavy cream in a bowl with the salt & pepper. In a separate bowl place the sausage, jalapeno pepper, cheese, garlic and cumin. Now place a third of the amount of egg mixture in the bottom of a 2 quart baking dish. Next, place a slice of bread into the dish. Place 1/3 of the amount of sausage mixture from step 2 onto the slice of bread. Repeat steps 3 to 4 until last slice of bread is on top. Add the remaining 1/3 of sausage ingredients evenly across the top slice of bread. Bake in oven for 15 minutes. Time Saving Tip: One package of 9.6 oz fully cooked Jimmy Dean® Hearty Sausage Crumbles may be substituted for one 16 oz. roll of fresh breakfast sausage in most dishes. It tasted okay but it was very dry. I've had breakfast casserole in the past and it was much better than this. I think maybe something has been left out or the steps are wrong. Avoid this one. Not the greatest. It sounded good looking at the ingredients, but it came out very dry. Not enough eggs for my taste either. Maybe it will work better with some adjustments.